There is something mystical and fascinating about a Library. Ardent book lovers will vouch for it. You enter a revered domain which encompasses knowledge and intrigues which only a mind craving for limitless information can fathom. One such magnificent knowledge bank in Delhi is in the form of the Shradhanand Memorial Library & Reading Room found at the corner from the community Centre in Jor Bagh, New Delhi. An inspiring old structure that stands the test of time and generations, over the years. A building, that, from the outside, exudes a secret that needs to be unearthed by only those who enter it- beauty of the printed word in a hard bound cover. 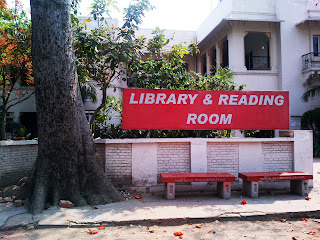 Once inside, there are rows and columns of books and sitting places which call out to its readers. In the four walls of this library, peace prevails. It just strengthens our belief that the advent of technology with its army of electronic notebooks and smart phones can never replace the tranquility and printed knowledge bank of a LIBRARY. Especially for the Girls traveling to Delhi! I am in my car with an American friend who is vising Delhi from the USA. While he is excitedly devouring the sites of Dilli in the moving car, the discussion went on to how Delhi maintains the magnificent balance between a progressive developed city and an enriched historical core. One such example that he alluded was that of the omnipresent Metro line that ran along the length of our journey. Yes, the Delhi Metro. A cornerstone of development symbolized by the brilliantly elevated and underground rail lines, vigorously zigzagging through the landscape of Delhi, somewhere touching the blue hues of the sky and somewhere, deep inside the earth, infusing life from 6 am to 11 pm every day. It’s been a historical journey since 2002 to make this milestone leap towards modernization of the transportation system of Delhi which has put us on the International map as having one of the most technologically advanced Mass Rapid Transit System’s in the world. It’s cheap, it’s convenient and it’s safe! An average Delhite who fought traffic hurdles with limited and over-crowded public transport buses, and sometimes waited for hours to get a transport ride back home or to his work place, today, pays anything between Rs. 8 to Rs 30, to reach his destination in the shortest possible time. The trains travel at an average of 80km/hour with each train’s average frequency being three minutes! There is special ladies compartment which is unheard of anywhere in the world!! There are ‘pink’ signs on the platform to indicte the ladies compartment which is either at the start of the finish of the platform. The ladies compartment saves you from the hustle bustle of the other compartments. In terms of area coverage, it is forecasted that the Delhi Metro will be bigger than the London Underground by 2021, the year of completion of the last phase of the project. In terms of ridership, it’s growing every day. While Tokyo subway system has the maximum passenger rides of 3.1 billion in a year, followed by Moscow Metro, NYC subway system and London Underground, the Delhi metro is close to their heels with 459 million passenger rides in year 2010-11. We as citizens of this modern metropolis, today, have a choice to use the most advanced and reliable form of public transport thanks to the Delhi Metro. You may be enjoying a morning stroll in Hauz Khas market, pouring over the artefacts, or Connaught place eating at your favourite restaurant or in Chandi Chowk market, buying spices; one thing is for sure, you will not be thinking of how you will get home/hotel, reliving the fear of over-priced taxis and over-crowded buses. You will walk down to the nearest Metro station, and be greeted by smiling attendants. Delhi’s advancement in public transport has arrived and it will soon overtake the world. A Case study we will be proud to tell and re-tell for years to come!! Visit our website for tour details www.thedelhiway.com. Picture Window theme. Powered by Blogger.